Aim: Alveolar bone resorption, often occurring after tooth extraction, can be minimized through socket preservation. This process uses a combination of Moringa leaf extract and demineralized freeze-dried bovine bone xenograft (DFDBBX) that is expected to generate both transforming growth factor-beta 1 (TGF-β1) expressions as a transcription factor associated with osteoblast differentiation and osteocalcin accelerating alveolar bone formation. This research aimed to analyze the role of the combination of Moringa leaf extract and DFDBBX induced in socket preservation when generating TGF-β1 and osteocalcin expressions. Materials and Methods: The left mandibular incisors of 56 Cavia cobaya were extracted and divided into four groups subjected to different socket preservation treatments. The first group treated with polyethylene glycol, the second group with DFDBBX, the third group with Moringa leaf extract, and the fourth group with a combination of DFDBBX and Moringa leaf extract. The C. cobaya were examined on days 7 and 30, after which the specimens were sacrificed and examined using an immunohistochemical technique. The resulting data were then analyzed using one-way ANOVA and Tukey's honestly significant difference tests. Results: There was a significant difference in TGF-β1 and osteocalcin expressions between the groups (P < 0.05). The highest mean amount of TGF-β1 and osteocalcin was found in the fourth group on both days 7 and 30. 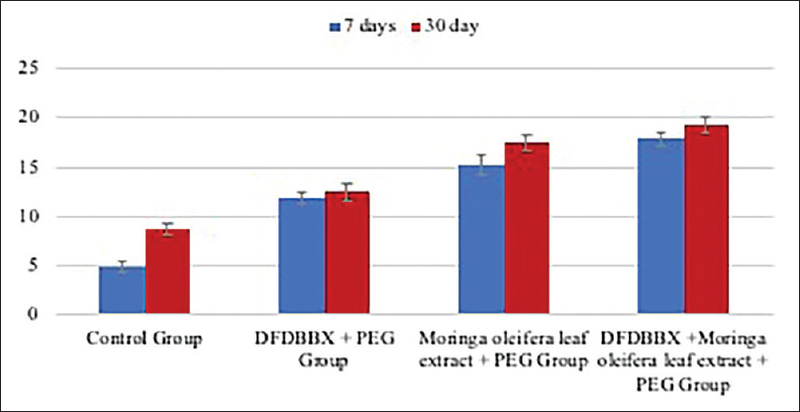 Conclusions: The combination of Moringa leaf extract and DFDBBX can effectively generate TGF-β1 and osteocalcin expressions during the preservation of tooth extraction sockets. Tooth extraction is a common procedure in the field of dentistry. Normal tooth extraction will be followed by a resorption process. Resorption is an accumulation of morphological and dimensional changes in the alveolar bone. Alveolar bone resorption mostly involves horizontal aspects, more commonly found on the buccal side than on the lingual or palatal side. Moreover, the process occurs rapidly during the first 6 weeks–2 years after tooth extraction after which it will continue, albeit at a lower rate. Thus, alveolar bone resorption after tooth extraction is inevitable. Six months after extraction, there will be rapid and irreversible alveolar bone resorption, approximately 40% of its height and 60% of its width. Although alveolar bone resorption after the tooth extraction is certain to occur, it still can be minimized. Minimal traumatic extraction is one means of minimizing alveolar bone resorption, that is, by carrying out socket preservation. The preservation of tooth extraction sockets is a procedure for inserting a regenerative material into a tooth extraction socket. The long-term objective of socket preservation is to maintain the dimensions of the alveolar bone. The occurrence of inflammation that initiates alveolar bone resorption will result in significant changes and can hinder the installation of fixed dentures and implants. The installation of fixed dentures and implants requires adequate alveolar bone structure and volume to support the placement of removable or fixed dentures, as well as implants. Loss of alveolar bone support will, therefore, affect the retention, stability, and comfort of dentures. A variety of bone graft materials has been widely studied in recent years, the most commonly used one in dentistry being demineralized freeze-dried bovine bone xenograft (DFDBBX). DFDBBX has an osteoinductive and osteoconductive which promotes and stimulates new bone growth. Therefore, to prevent the occurrence of inflammation, it is necessary to heal tissue with natural materials considered to be safer, cheaper, and more widely available in daily life. One of the natural ingredients that supposedly offers many benefits is Moringa oleifera leaf. M. oleifera leaf contains Vitamins C, α and β-carotene, as well as 12 flavonoids, including quercetin and kaempferol. Several studies have posited that flavonoids possess several beneficial characteristics as an anti-inflammatory. Transforming growth factor-beta (TGF-β) is considered a multifunctional cytokine that regulates the growth, differentiation, adhesion, and apoptosis of various cell types. TGF-β is involved in the process of bone formation in terms of the differentiation and maturation of osteoprogenitor cells into osteoblasts. TGF-β1 can stimulate osteoblast activity, lead to new bone formation, as well as accelerate fracture healing and skeletal abnormalities. Moreover, osteocalcin is one of the noncolonic protein bone matrices that occur in large quantities. Osteocalcin can also be used as a biomarker in accurately evaluating the bone formation process., As a result, this research aimed to analyze the role of a combination of Moringa leaf extract and DFDBBX for tooth extraction sockets preservation in generating osteocalcin, TGFβ1, and osteoblast expression. This research has been approved by the Faculty of Dental Medicine, Universitas Airlangga Health Research Ethical Clearance by the number 035/HRECC.FODM/IV/2017. This research constituted an experimental study with randomized postcontrol design using healthy and active male C. cobaya animals weighed 300–350 g and aged 3–3.5 months. M. oleifera leaf extract was performed using maceration process. Then, the participants were divided into eight groups consisting of seven participants based on Lemeshow formula. Groups I and II were treated with polyethylene glycol (PEG) as control, Groups III and IV were given DFDBBX + PEG, Groups V and VI were treated with Moringa leaf extract + PEG, and Groups VII and VIII were given Moringa leaf extract + DFDBBX + PEG. Groups I, III, V, and VII were sacrificed and examined on day 7 while Groups II, IV, VI, and VIII on day 30. The C. cobaya were first anesthetized intramuscularly using 0.2 cc ketamine (20 mg/300 mg). Each participant's left mandibular incisor was then cleared of food scraps with a water spray and dried before being extracted. In the next stage, approximately 0.1 ml of a combination of Moringa leaf extract, DFDBBX (Bonegraft 10 mesh/2000 μ, Batan) and PEG was introduced into the sockets by syringe. The socket was stitched with polyamide monofilament (Braun Aesculap, USA). All of the participants were sacrificed depend on the duration for each group. The mandible for each sample was cut, decalcified, and embedded. Immunohistochemistry staining preparation was performed in Anatomical Pathology Laboratory, Dr. Soetomo National General Hospital, Surabaya. 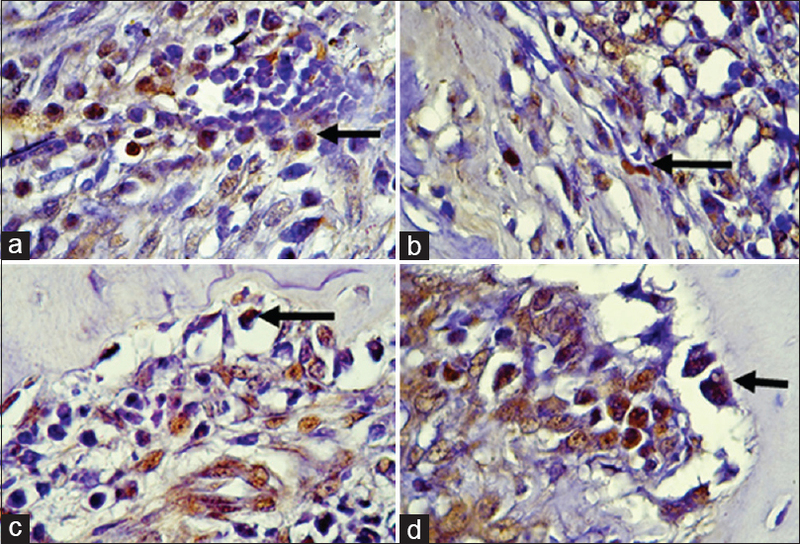 The immunohistochemical evaluation was performed using monoclonal antibody anti-TGF-β1 (ab190503, Abcam, USA) and monoclonal antibody anti-osteocalcin (ab13420, Abcam, USA). The amount of TGF-β1 and osteocalcin expressions was then observed in a microscope at a magnification of ×1000 and a field number of 20. Meanwhile, capturing microscopic images was performed at a magnification of ×400. The TGF-β1 and osteocalcin expressions observed were then calculated manually using a modified semi-quantitative Remmele scale. 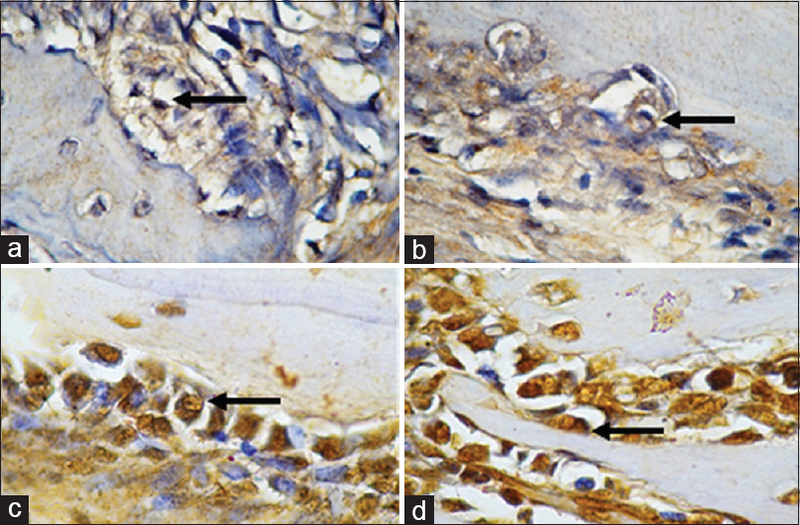 Positive TGF-β1 and osteocalcin expressions appeared as brown under the light microscope. Thereafter, the data were statistically tested using one-sample Kolmogorov–Smirnov, one-way ANOVA, and Tukey's honestly significant difference (HSD). Based on the research results, the mean value of TGF-β1 and osteocalcin expression from day 7 to day 30 can be seen in [Table 1]. The bar graph in [Figure 1] and [Figure 2] showed the highest TGF-β1 and osteocalcin expression was found in Groups VII and VIII. On the other hand, the lowest TGF-β1 and osteocalcin expression were found in Groups I and II. Nevertheless, the TGF-β1 and osteocalcin expressions on day 30 were higher than on day 7. Based on the Kolmogorov–Smirnov test, data were normally distributed (P > 0.05). The data were then analyzed using a one-way ANOVA test to identify differences between the groups. The results showed that there was a difference in the mean amount of TGF-β1 expression with the P = 0.000 and osteocalcin expression with the P = 0.000 (P < 0.05). At this point, a Tukey HSD test was conducted to determine differences in TGF-β1 and osteocalcin between the groups. The results of the Tukey HSD test revealed a significant difference on days 7 and 30 in TGF-β1, and osteocalcin expression is shown in [Table 1]. [Figure 3] contains microscopic cases of TGF-β1 expression on the extraction sockets of C. cobaya on day 30 based on the results of the immunohistochemical examination using a light microscope. Microscopic images on day 30 after the treatments of osteocalcin expression are depicted in [Figure 4]. Under normal conditions, a tooth is connected to the alveolar bone by periodontal tissue. According to Hansson and Halldin, alveolar bone acts mechanically in a similar manner to a space filled with periodontal ligaments and teeth. However, when a tooth is extracted, the alveolar bone contains space. In the early postextraction period, bone bundle resorption will occur and resulting socket will gradually fill with the lamellar and cancellous bone which renders the alveolar bone more rigid against stress and strain. In other words, the absence of the tooth can reduce alveolar bone resistance to stress and strain, resulting in its resorption. DFDBBX is a type of xenograft derived from bovine matter. DFDBBX is also known to possess a crystalline structure, porosity, and carbonate content similar to the human bone so that natural osteoconduction can be obtained. Xenograft has osteoconductive properties that can accelerate new bone formation in tooth extraction sockets and may also decrease alveolar bone resorption through blood clot stabilization, scaffold action, and external sources of minerals and collagen. Similarly, a research conducted by Cohen also found that xenografts can provide both a wider area to stimulate the occurrence of angiogenesis and to support revascularization, as well as have osteoconductive properties to help osteoblast migration from the base of the sockets playing an important role in the process of new bone formation. Moringa leaf extract is rich in flavonoids, saponins, alkaloids, and tannins. Flavonoids contained in Moringa leaf extract, according to a study conducted by Zhang et al., can stimulate osteoblast proliferation and differentiation. This is also supported by research conducted by Patel, revealing that the administration of flavonoid compounds derived from Moringa leaf extract can help osteoblast differentiation, leading to bone formation. Meanwhile, saponin has an effect on osteogenic activity that promotes the proliferation and differentiation of osteoblasts. The results of this research also showed that the amount of osteocalcin in the group given only DFDBBX on both days 7 and 30 was greater than in the control group. DFDBBX is known to be a substance that stimulates osteogenesis. Thus, DFDBBX can increase osteoblasts. Osteoblasts produce noncollagen proteins, one of which is osteocalcin. Consequently, the amount of osteocalcin formed will be greater than that in the control group. Similarly, Khan states that graft given to the extraction socket can trigger osteoinduction and stimulate bone growth. Flavonoids contained in Moringa leaf extract also contain kaempferol and quercetin. Kaempferol, according to research conducted by Guo et al., may inhibit osteoclastic resorption and stimulate both the occurrence of osteoblast differentiation and the mineralization of cells. In general, kaempferol inhibits cyclooxygenase-2 enzyme, leading to the inhibition of prostaglandin synthesis, and in turn, a decrease in PGE-2 and macrophage infiltration. PGE-2 plays a role in osteoclast formation either directly or through the receptor activator of nuclear factor kappa-Β (RANK) ligand, resulting in the differentiation of osteoclast precursors into mature osteoclasts. On the other hand, a decrease in the amount of macrophage cells will be followed by a decrease in inflammatory mediators, such as histamine, serotonin, and pro-inflammatory cytokines (tumor necrosis factor-α, interleukin [IL]-1, and IL-6). As a result, the amount of pro-inflammatory cytokines will decrease. Furthermore, tannin is a potent inhibitor of osteoclast differentiation by inhibiting RANK activation. As a result, the number of osteoclasts will decrease, with the result that bone resorption decreases. The Moringa leaf extract has indirect osteoinductive properties because of its nature resulting from its contents. Flavonoids contained in Moringa leaf extract can even stimulate osteoblast proliferation and differentiation. Furthermore, tannins contained in Moringa leaf extract can inhibit osteoclast differentiation. The activity will then support the formation of new bone facilitated by DFDBBX as a scaffold. TGF-β is a potential stimulator for bone formation, initiating osteoblastic differentiation and osteoid matrix synthesis as well as inhibiting protease synthesis, especially matrix metalloproteinase and its degrading enzymes. TGF-β can also inhibit resorption by decreasing osteoclast formation and differentiation as in mature osteoclast activity as well as stimulating apoptosis. This result is consistent with a research conducted by Guskuma et al. showing that on day 7, bone defect is still inflamed and enters the early stages of resorption, although osteoblast progenitor cells begin to appear, which are characterized by the expression of TGF-β1. On day 30, bone defects enter the early stages of the bone formation process. This is in line with a research conducted by Irinakis revealing that, in week 4, bone deposition begins to occur in the tooth extraction socket. At that time, osteoblasts and other osteogenic tissues begin to form in significantly increased numbers. At the final phase of osteoblast differentiation or the early stage of mineralization, osteocalcin is secreted. The final stage of osteoblast differentiation or the early stage of mineralization occurs at week 4. Thus, the amount of osteocalcin formed on day 30 is certainly higher than on day 7. The results suggest that the combination of osteoconduction and osteoinduction properties of these two materials can generate significant amounts of TGF-β1 and osteocalcin expressions. Therefore, the combination of Moringa leaf extract and DFDBBX leads to a greater chance of successful postextraction socket preservation by accelerating alveolar bone regeneration. Finally, it can be concluded that the combination of Moringa leaf extract and DFDBBX is effective in generating TGF-β1 and osteocalcin expressions in the alveolar bone. Van der Weijden F, Dell'Acqua F, Slot DE. Alveolar bone dimensional changes of post-extraction sockets in humans: A systematic review. J Clin Periodontol 2009;36:1048-58. Vittorini Orgeas G, Clementini M, De Risi V, de Sanctis M. Surgical techniques for alveolar socket preservation: A systematic review. Int J Oral Maxillofac Implants 2013;28:1049-61. Allegrini S Jr., Koening B Jr., Allegrini MR, Yoshimoto M, Gedrange T, Fanghaenel J, et al. Alveolar ridge sockets preservation with bone grafting – review. Ann Acad Med Stetin 2008;54:70-81. Pagni G, Pellegrini G, Giannobile WV, Rasperini G. Postextraction alveolar ridge preservation: Biological basis and treatments. Int J Dent 2012;2012:151030. Irinakis T. Rationale for socket preservation after extraction of a single-rooted tooth when planning for future implant placement. J Can Dent Assoc 2006;72:917-22. Burali SC, Kangralkar V, Sravani OS, Patil SL. The beneficial effect of ethanolic extract of Moringa oleifera on osteoporosis. Int J Pharm Appl 2010;1:50-8. Copin JP, Xu Y, Chen H, Pan MH, Ho CT, Juliani R, et al. Determination of flavonoids by LC/MS and anti-inflammatory activity in Moringa oleifera. J Funct Food 2013;5:1892-9. García-Lafuente A, Guillamón E, Villares A, Rostagno MA, Martínez JA. Flavonoids as anti-inflammatory agents: Implications in cancer and cardiovascular disease. Inflamm Res 2009;58:537-52. Miyazono K. Positive and negative regulation of TGF-beta signaling. J Cell Sci 2000;113 (Pt 7):1101-9. Claros S, Rico-Llanos GA, Becerra J, Andrades JA. A novel human TGF-β1 fusion protein in combination with rhBMP-2 increases chondro-osteogenic differentiation of bone marrow mesenchymal stem cells. Int J Mol Sci 2014;15:11255-74. Priyana A. The Role of Serum Bone Marker in in Osteoporotic. Univer Med 2007;26:152-9. Kresnoadi U, Raharjo T, Rostiny R. Effects of mangosteen peel extract combined with demineralized freeze-dried bovine bone xenograft on osteocalcin, collagen 1, and osteoblast as alveolar bone regeneration in socket preservation. J Indian Prosthodont Soc 2018;18:117-21. Lemeshow S, Hosmer DW Jr., Klar J, Lwanga SK. Adequacy of Sample Size in Health Studies. New York: John Wiley & Sons; 1990. p. 41-4. Kresnoadi U, Rahayu RP, Rubianto M, Sudarmo SM, Budi HS. TLR2 signaling pathway in alveolar bone osteogenesis induced by aloe vera and xenograft (XCB). Braz Dent J 2017;28:281-6. Fiorellini JP, Kim D, Chang YC. Anatomy, structure, and function of the periodontium. In: Newman MG, Takei H, Klokkevold PR, Carranza FA, editors. Carranza's Clinical Periodontology. 13th ed. Philadelphia, USA: Elsevier – Health Science Division; 2014. p. 19-49. Hansson S, Halldin A. Alveolar ridge resorption after tooth extraction: A consequence of a fundamental principle of bone physiology. J Dent Biomech 2012;3:1-8. Cohen RE, Alsuwaiyan A, Wang BY. Xenografts and periodontal regeneration. J Orthod Endod 2015;1:1-6. Zhang DW, Cheng Y, Wang NL, Zhang JC, Yang MS, Yao XS, et al. Effects of total flavonoids and flavonol glycosides from Epimedium koreanum nakai on the proliferation and differentiation of primary osteoblasts. Phytomedicine 2008;15:55-61. Patel C, Rangrez A, Parikh P. The anti-osteoporotic effect of Moringa oleifera on osteoblastic cells: Saos 2. IOSR J Pharm Biol Sci 2013;5:10-7. Rodríguez-Carballo E, Gámez B, Ventura F. P38 MAPK signaling in osteoblast differentiation. Front Cell Dev Biol 2016;4:40. Khan SN, Cammisa FP Jr., Sandhu HS, Diwan AD, Girardi FP, Lane JM, et al. The biology of bone grafting. J Am Acad Orthop Surg 2005;13:77-86. Guo AJ, Choi RC, Zheng KY, Chen VP, Dong TT, Wang ZT, et al. Kaempferol as a flavonoid induces osteoblastic differentiation via estrogen receptor signaling. Chin Med 2012;7:10. Chiechi LM, Micheli L. Utility of dietary phytoestrogens in preventing postmenopausal osteoporosis. Curr Top Nutraceutical Res 2005;3:15-28. Kim SY, Park JY, Lee SH, Woo JT, Kim HT, Park EK. Inhibitory effects of hydrolisable tannins on osteoclast differentiation and function through inhibition of map kinases and ap-1/nf-kb activations. In: 52nd Annual Meeting of the Orthopaedic Research Society. 2006;1:1572. Available from: https://pdfs.semanticscholar.org/677a/c6b86915a94af14d244c0cd78de752a8c59f.pdf. Kini U, Nandeesh BN. Physiology of bone formation, remodeling and metabolism. radionuclide and hybrid bone imaging. In: Fogelman I, Gnanasegaran G, Wall H, editors. Radionuclide and Hybride Bone Imaging. London: Springer-Verlag Berlin Heidelberg; 2012. p. 29-58. Guskuma MH, Hochuli-Vieira E, Pereira FP, Rangel-Garcia I Jr., Okamoto R, Okamoto T, et al. Evaluation of the presence of VEGF, BMP2 and CBFA1 proteins in autogenous bone graft: Histometric and immunohistochemical analysis. J Craniomaxillofac Surg 2014;42:333-9. Agata H, Asahina I, Yamazaki Y, Uchida M, Shinohara Y, Honda MJ, et al. Effective bone engineering with periosteum-derived cells. J Dent Res 2007;86:79-83.